I am usually quite good with numbers, but recently, that hasn't been the case. 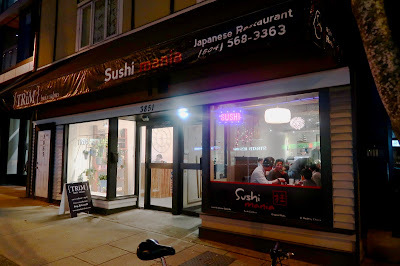 This time, not only did I miscalculate the amount of time it would take for me to get to Sushi Mania on Main St., but I also bussed down to 32nd Ave. instead of 23rd Ave. Getting stuck in a traffic jam did not exactly help. After doing a few facepalms, I had to frantically speed walk to the restaurant so that I would not miss any sushi photo opportunities. I ended up being 30 minutes late to my own dinner, but thankfully, Gee, Pat, and Jaden were patient enough, and none of the food landed on the table yet. Sushi Mania has a reputation for being affordable and decent as well as having a good variety of dishes. Indeed, we found many intriguing appetizers and special rolls, and much of the food that whizzed by us looked appealing. However, we agreed to keep the dinner light, as dinners with me are almost always followed by a visit to a dessert shop. The restaurant was quite busy, and we found the seating a little tight, but bearable. 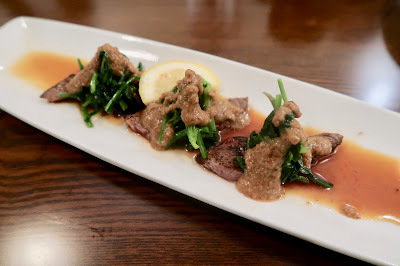 After having a very good version of this from Ki Isu, I was looking forward to trying the same dish here. These delectable salmon nuggets were no disappointment. 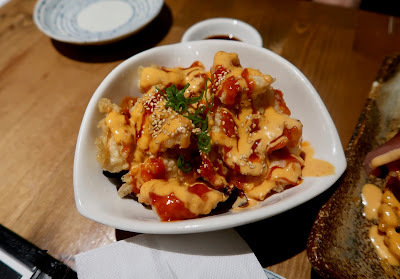 The salmon inside was very juicy, and the batter had just the right amount of crispiness. The spicy mayonnaise complemented the nuggets without overwhelming them. 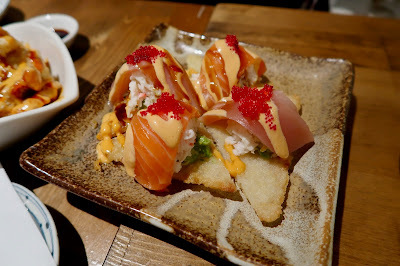 Next, we had the Sushi Pizza, which came with salmon, tuna, crab meat, and avocado. 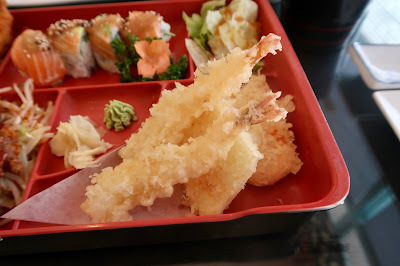 The fish was fresh with smooth, appealing textures, while the crispy rice at the bottom was not hard. 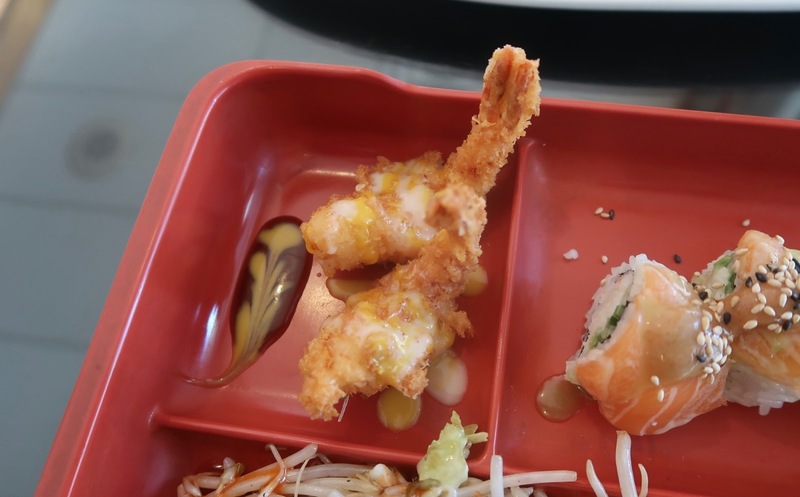 We also enjoyed the sweet imitation crab, but thought there could have been a bit more of it. 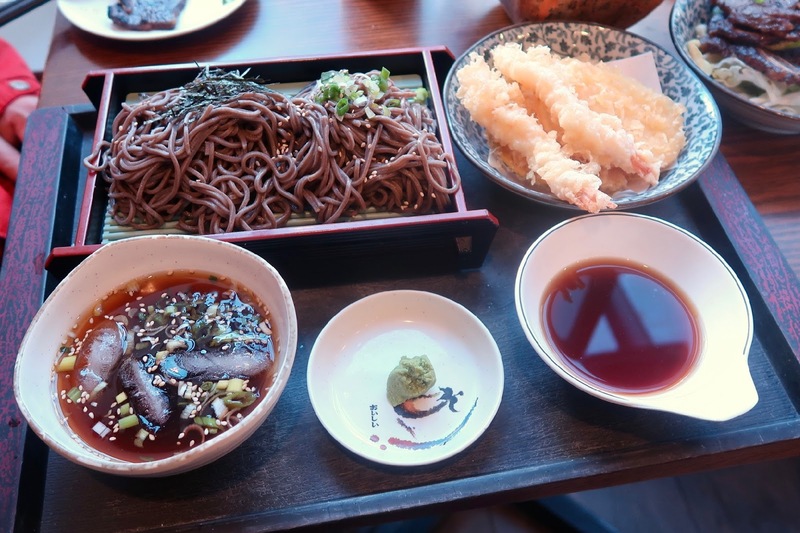 While we were musing over the menu, one of us spotted something very cool-looking, and we were determined to order it before we even fully knew what it was. 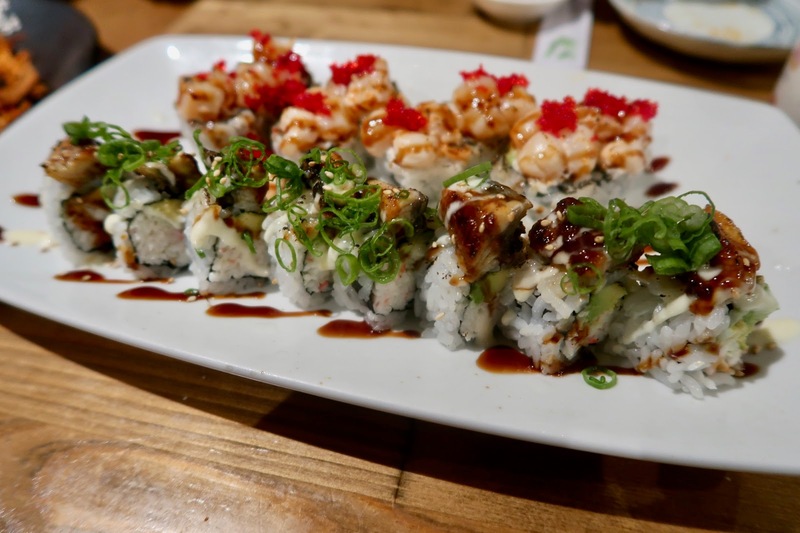 This turned out to be the Crunchy Munchy Roll, with spicy tuna, cucumber, and yam tempura bits. 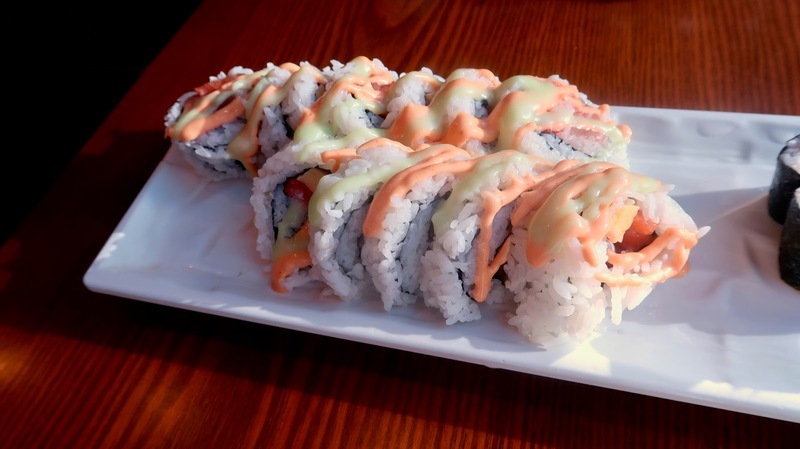 There wasn't a lot of spicy tuna, so the tuna provided little flavour to the roll. 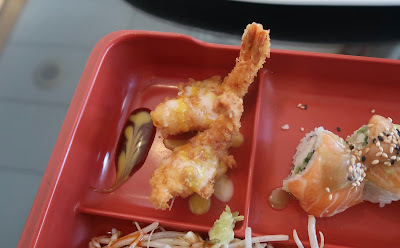 What produced most of the flavour were the yam tempura bits on top. These were crunchy and went well with the accompanying drizzle of spicy mayonnaise. 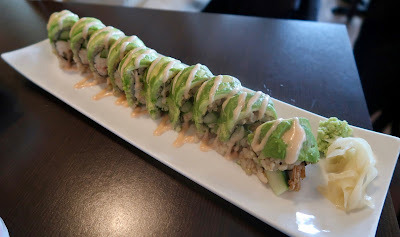 Our next roll of choice was the Black Dragon Roll, which came with crab meat, avocado, cucumber, and seared unagi. The roll came in small pieces, but was neatly constructed. The searing of the unagi created a wonderful smokiness, which was easily the highlight of the roll. The Mania Roll consisted of crab meat, avocado, cucumber, and seared chopped scallop. 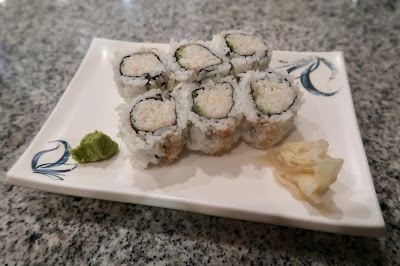 Once again small but neatly constructed, this roll came with excellently seared scallops. 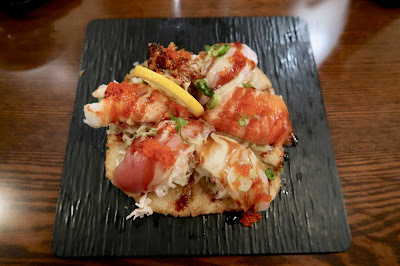 The soft textures of the scallop and the sweet crab meat were a delight. For some odd reason, our Assorted Sashimi arrived towards the end of our meal. 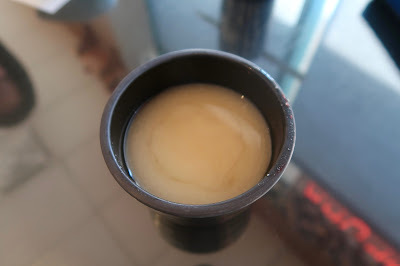 The hokkigai tasted the freshest and had a nice sweet flavour. 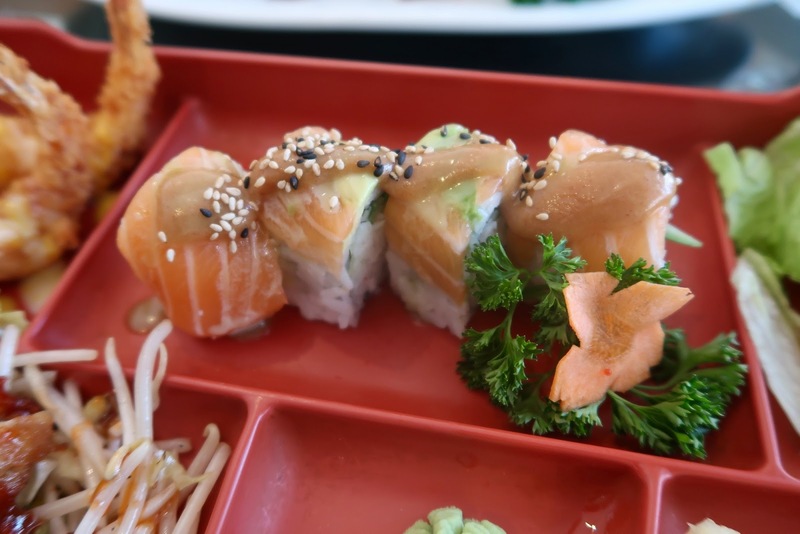 The salmon and tai also tasted fresh. 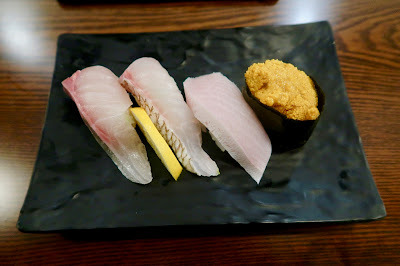 The tuna and tako were slightly less fresh, and the saba was rather chewy and salty. Even though the restaurant was packed the whole time we were there, we received friendly service. 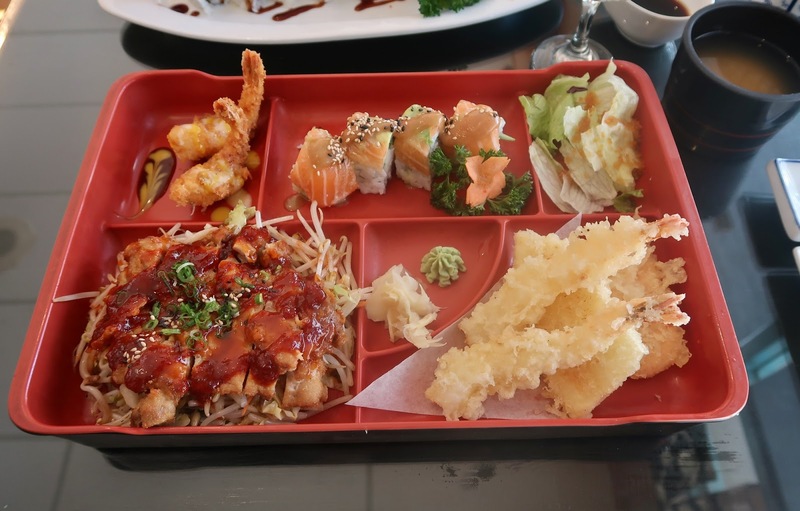 Most of the food exceeded our expectations, especially after considering the price. 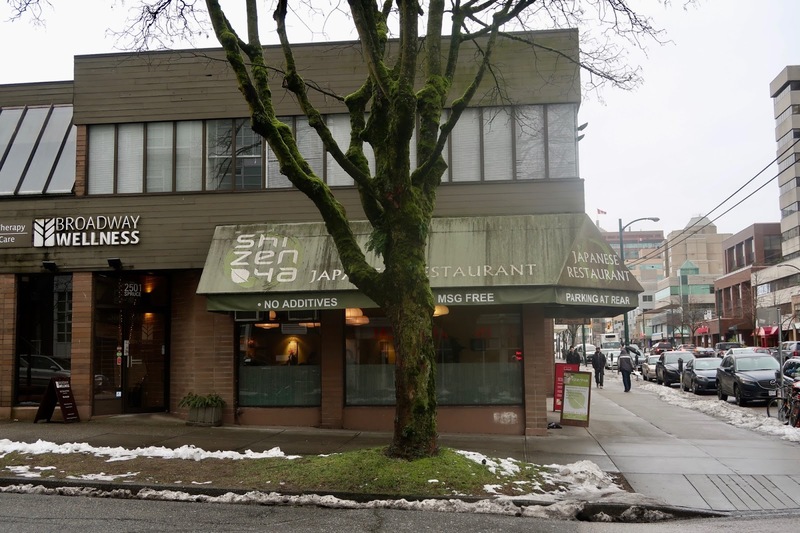 If this place was a little more convenient to bus to from SFU, I would be a regular. 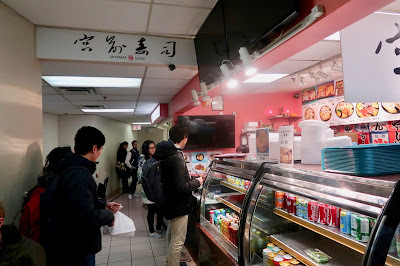 While waiting for our movie to start, Puzzlefighter and I were in Chinatown looking for Japanese eats. 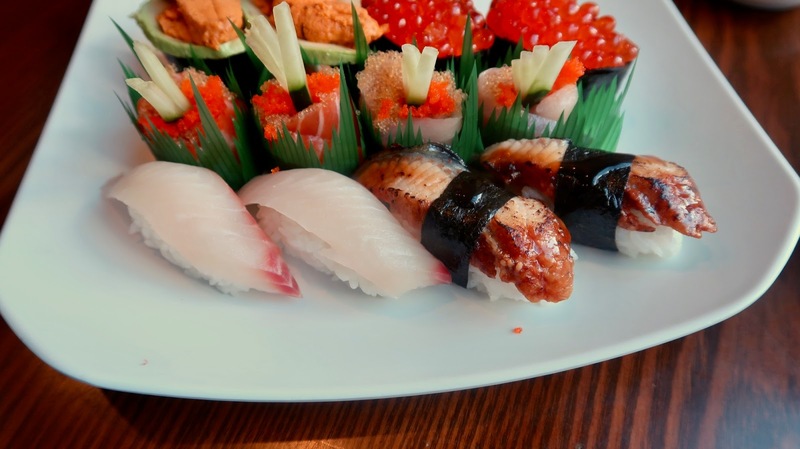 Puzzlefighter likes fancy nigiri even more than I do, but when we eat together, we always end up ordering insane amounts of food. One time, the two of us went to MYST and ended up paying more than $90 for dinner. I literally have no idea how we ended up in that predicament. It's not like we're particularly big guys. This time, since both of us were quite hungry, we went to Sushi Den to keep the bill within reason. 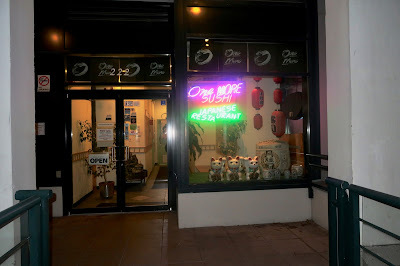 Sushi Den is a moderately large Japanese restaurant located near International Village. 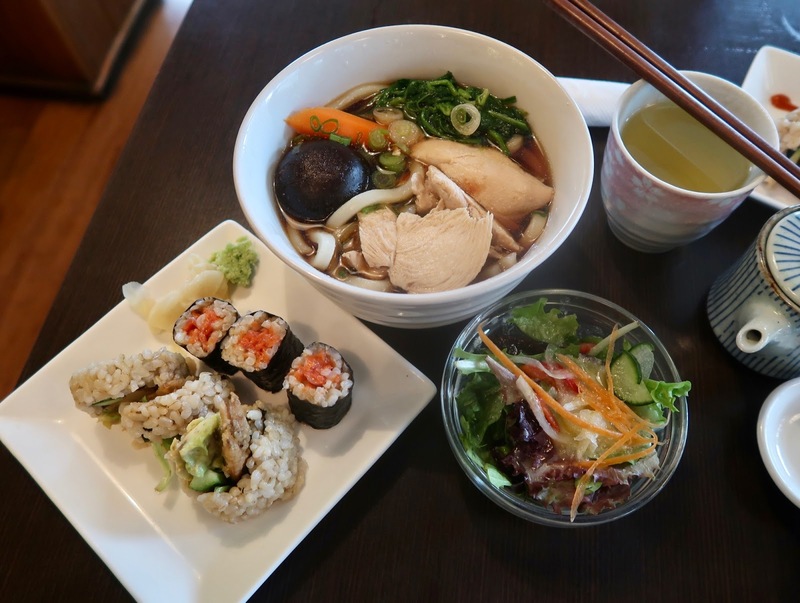 It is quite popular due to its cheap pricing and decent assortment of menu items. Unfortunately, this meant that there was no way that Puzzlefighter and I were getting out of there while still able to walk properly. 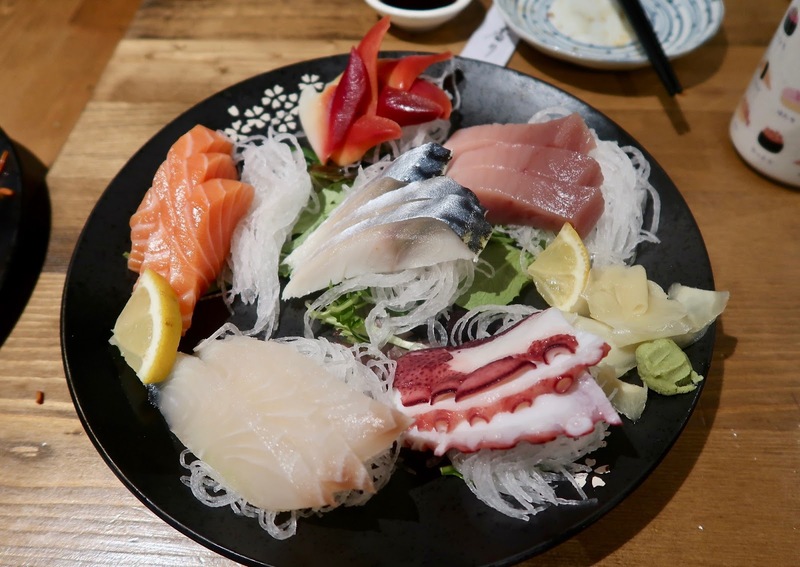 The Toro Sashimi was just $9 for 6 pieces, and we were pleased with the freshness. The toro was smooth and buttery, and it came in generous slices. Some of the pieces were noticeably softer than others. Next up, the Negihama Roll (chopped yellowtail with green onion) was neatly wrapped. 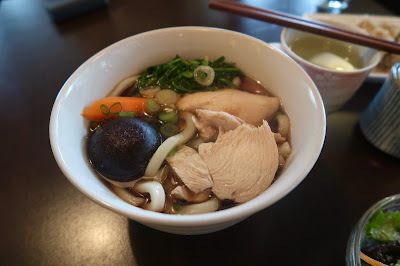 The green onion gave off a nice zing and a slight crunch, while the seaweed was not too chewy. 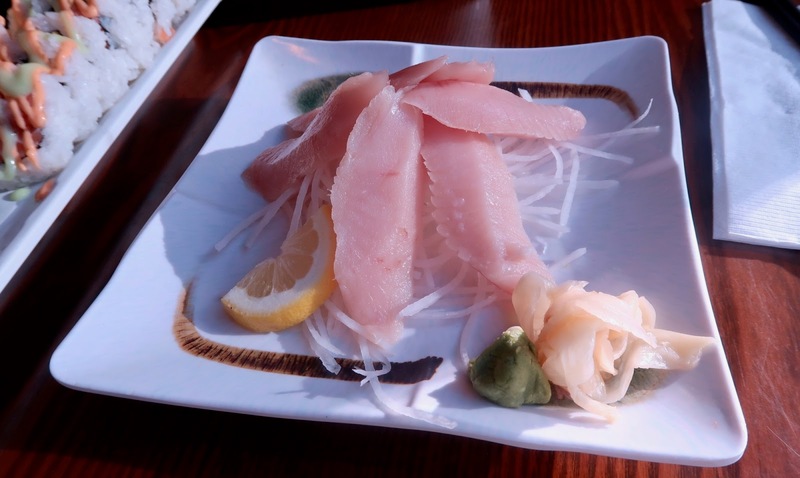 However, the flavour of the hamachi was not particularly rich. Since we went out of control on the ordering, we thought it would be fitting to get the Out of Controll, a special roll with "lots of stuff." We found salmon, tuna, tamago, and sockeye inside the roll, which was dressed with spicy mayonnaise and coleslaw dressing. Although it did seem like the chef went a little out of control, the fish was fresh, and the roll was very large and filling. 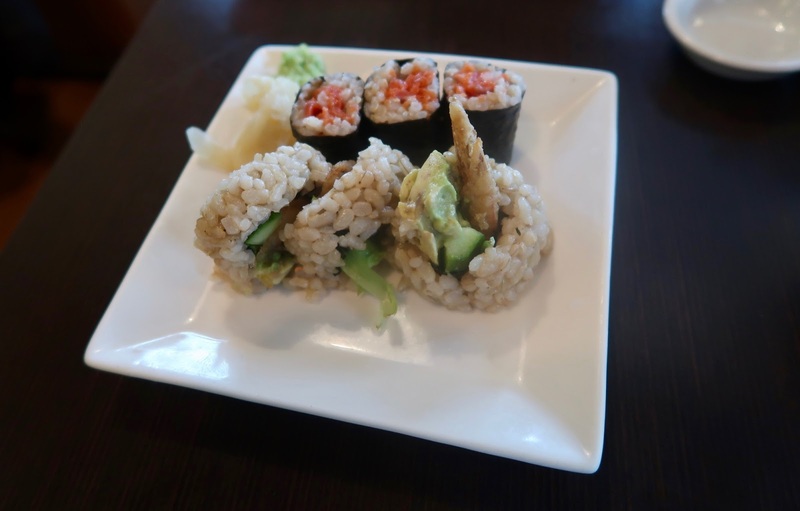 We found the roll a little rice-heavy, which weakened the flavours of the fish. Of course, we had to try both types of flower nigiri, which was essentially sashimi wrapped around masago and cucumber (no rice). 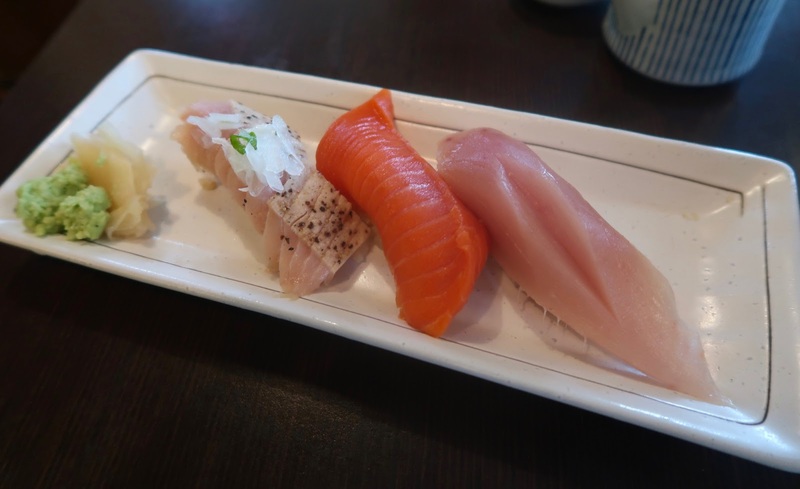 The Flower Tuna Nigiri came with really soft and fresh tuna, while the Flower Salmon Nigiri contained fresh, buttery salmon. We felt that the cucumber was just there for visual appeal, as it didn't really match the flavour or texture of the fish. 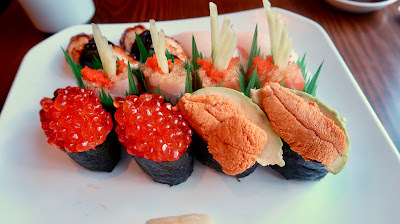 The Ikura Nigiri came in huge portions, and the creamy flavours of the uni and avocado worked well together in the Uni Nigiri. The seaweed wrapping was a little tough though, which made it hard to eat the nigiri neatly. 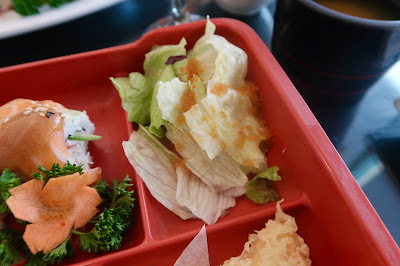 The Tai Nigiri (snapper) was not tough, but came with a little too much sushi rice, which overwhelmed the flavour of the tai. 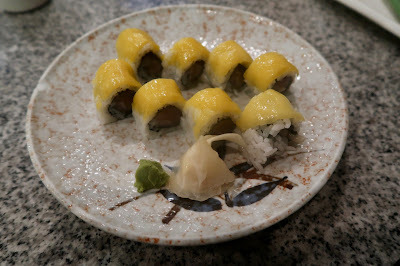 The Unagi Nigiri, on the other hand, was really juicy and meaty. The unagi had an excellent smoked flavour. 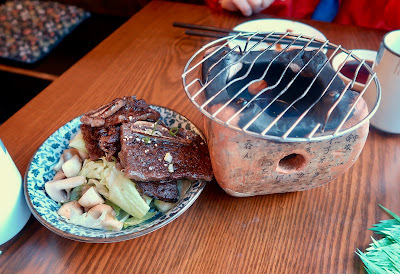 The Beef Short Rib Yakiniku is a fun dish where you can grill your own short ribs on a small tabletop grill. Since I didn't want to set the restaurant on fire, I let Puzzlefighter do most of the grilling. When done correctly, the short ribs have a nice charred flavour. The mild marinade did not overpower the ribs, and the meat was not tough due to the thin cuts. After all the food above, we decided to get a filler to really hit it home. The Ten Zaru Soba came with 5 pieces of tempura (two prawns and one piece each of yam, sweet potato, and kabocha). We found the tempura quite greasy, but sufficiently juicy and crispy. The cold soba was refreshing, and the green onion and sesame seeds livened up the dipping sauce. 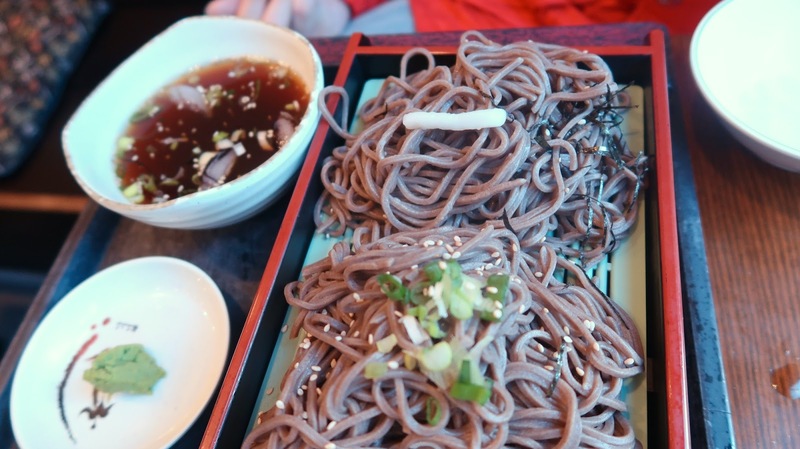 We quite enjoyed the soba until Puzzlefighter found a slight error. Overall, the food was decent given the prices, and the service was friendly and adequate. Although the atmosphere isn't particularly fancy, it is a place where you can get a good variety of food for budget prices. Despite the amount of food we ordered, our bill was only slightly over $60 altogether. After waking up from Vancity Noms' class and having an epic piano-off in the library (where we got a little too loud), the two of us were somewhat ready to resume our grand sushi crawl at UBC's Vancouver campus. I say "somewhat" because Vancity Noms was still somewhat full from eating way too much at the first stop of our crawl, and I felt like I had consumed way too much soy sauce. Whereas others would be burnt out from doing such a crawl, I was soy sauced out. 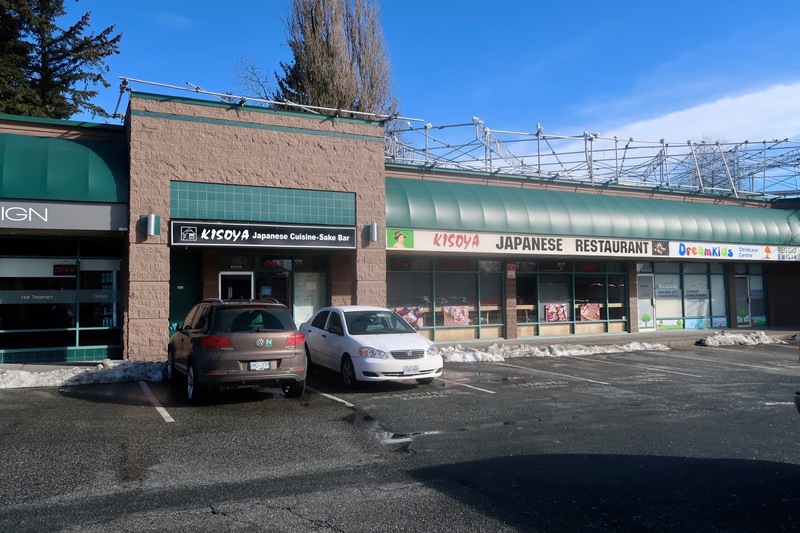 However, the time was ticking, and if we didn't make our move, the sushi places would have started closing. This post will cover the last three. Miyamae serves a variety of bento boxes, which range from $6.95 to $11.95. 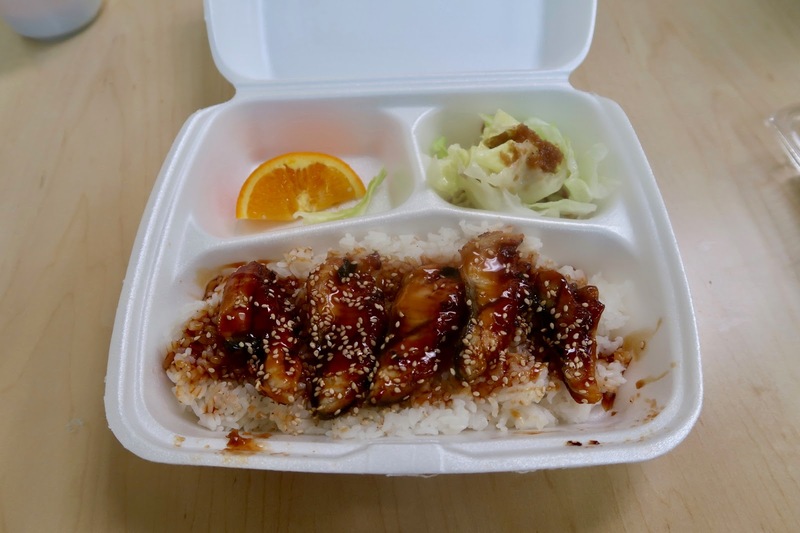 I went for one of the higher-end ones since I had an unagi craving at the time. 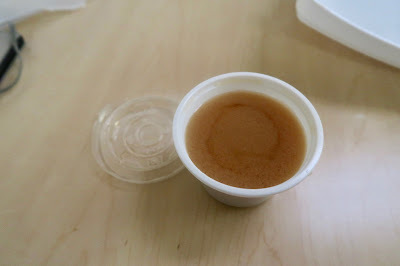 The Miso Soup came with adequate miso paste, some seaweed, and some tofu. Although it was rich in miso flavour, it was also quite salty. 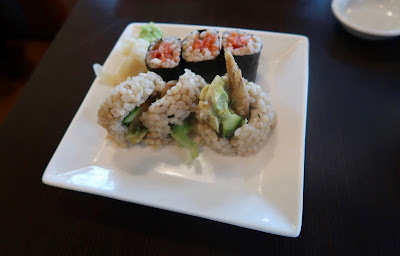 If anyone were to make sushi that did not look appealing to me, this was about as close as one could get. 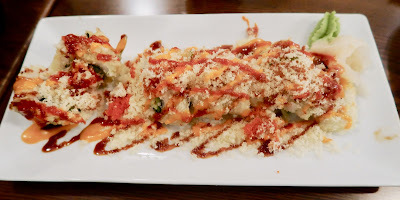 The Dynamite Roll featured crunchy tempura prawn and a somewhat decent filling, but the sight of the rice made me go "Uh oh..." It was not only soggy and mushy, but there was also too much of it. The one thing they did nail was the Slice of Orange. Although it wasn't exactly the prettiest slice of orange ever, it was one of the sweetest and juiciest slices of orange I have ever had. 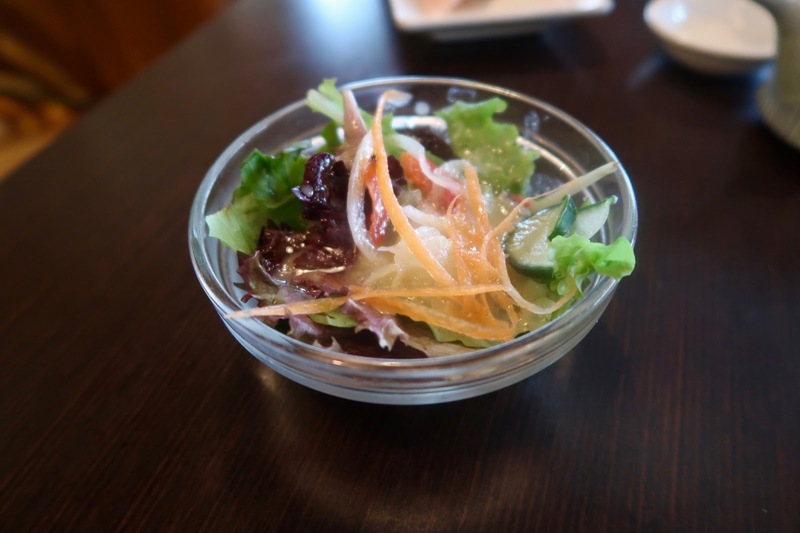 The Salad consisted mainly of lettuce, and I wasn't fond of the vinaigrette dressing, which tasted strangely like soy sauce. The Unagi Don came with very soft, but somewhat fatty unagi. 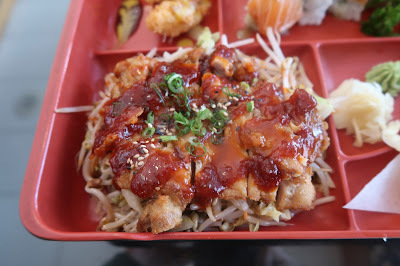 The unagi sauce was sweet, and the don was sizable enough to be a good filler. 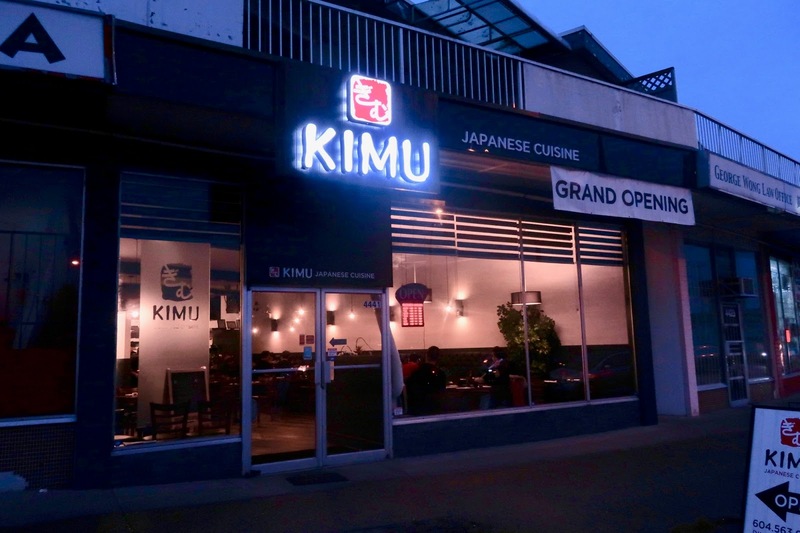 After I'd finished the bento box, Vancity Noms suddenly had to leave, so I was left to make the long, perilous journey from University Village to Wesbrook Village in the dark all by myself. I decided to walk there in order to burn a few extra calories. I made my way through various hazards, which included trees with branches, students playing soccer, and eerily quiet residential areas, before arriving at Togo Sushi 15 minutes before they closed at 8 p.m. I was lucky enough to be the last customer whose order they took. 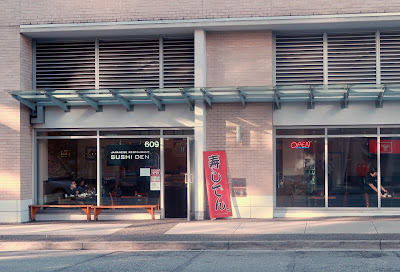 Togo Sushi is a small fast food chain with locations scattered across Metro Vancouver. I've always considered it to be the best of Metro Vancouver's fast food sushi joints, and I was hoping for no disappointment here. 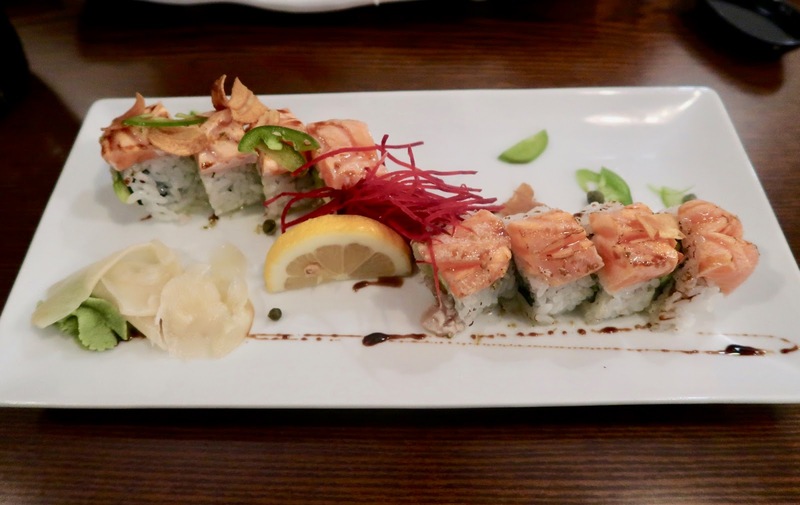 The Seared Salmon Roll was a new addition to the menu, and it was fairly well executed. It had a nice, smoked flavour that was accompanied by a good helping of spicy mayonnaise. The imitation crab meat was sweet, and the textures were on point. 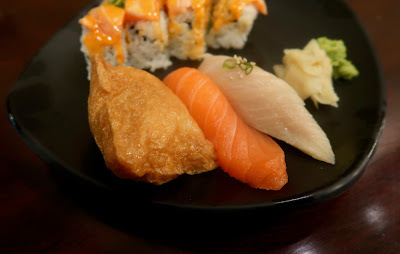 On the other side of the plate, the Inari Nigiri had a nice, sweet flavour and tasted somewhat eggy. The salmon in the Salmon Nigiri was creamy, but weak in flavour. The rice was a bit too tightly packed, but at least the fish-to-rice ratio was correct. Finally, the toro was soft, but tasted quite fishy. Throughout my visits to Togo Sushi, I've found that tuna is consistently one of their weaknesses. Nonetheless, what I had at Togo Sushi was good enough to be the highlight of my entire crawl. 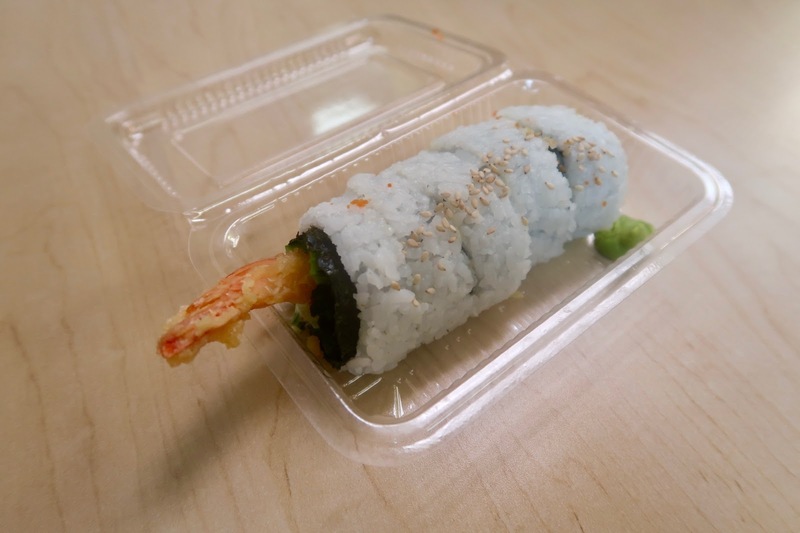 I'd originally planned to try the sushi at the nearby Save-On-Foods as well, but once I saw that they served exactly the same sushi as Nesters Market at SFU, I ran away as quickly as I could. 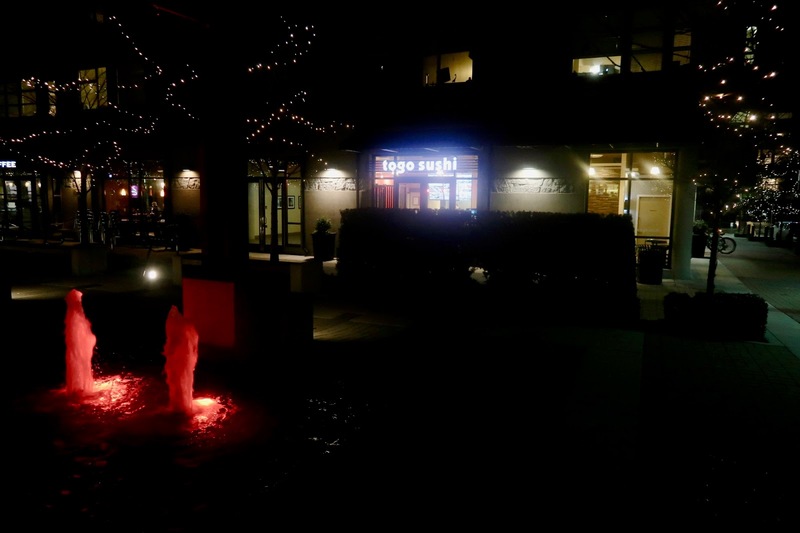 By the time I walked all the way back to University Village, everything was dark and deserted, with signs of life few and far between. 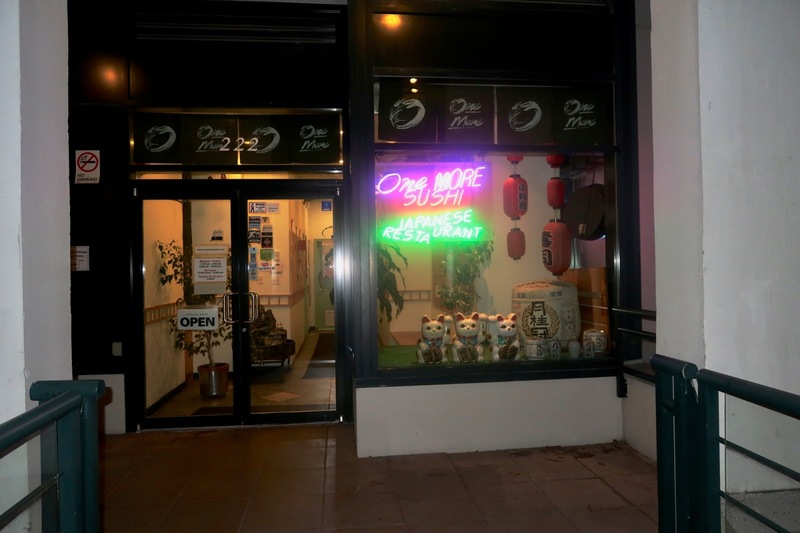 I walked into One More Sushi at 9:30 p.m., just half an hour before closing time, and I was their only customer. 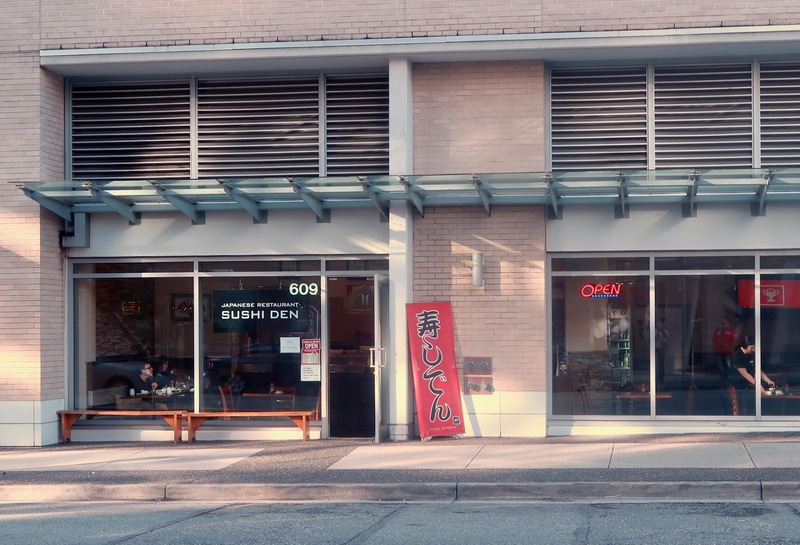 If you are looking for something you can legitimately call a sushi restaurant at UBC, One More Sushi is the place. It was a large restaurant that resembled a Chinese diner more than a Japanese restaurant. 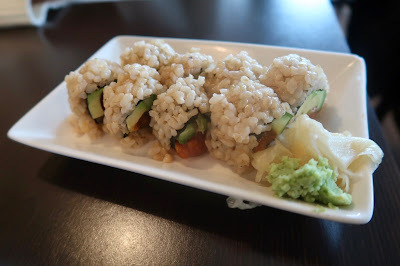 The menu items were quite pricey, but the special that day allowed me to order a California Roll for half price. 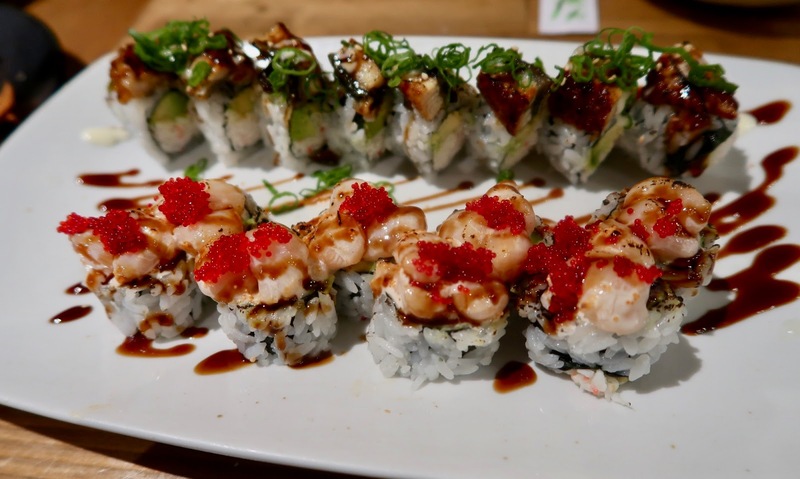 Even though I was stuffed, one simply does not say "no" to discounts on sushi. 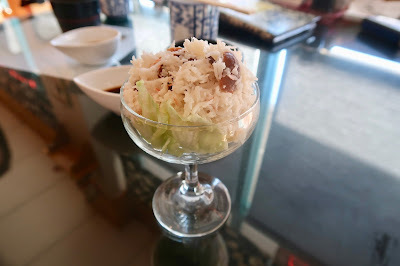 The California Roll came with an abundance of sweet crab meat. However, there wasn't really enough mayonnaise inside, so things ended up a bit dry. 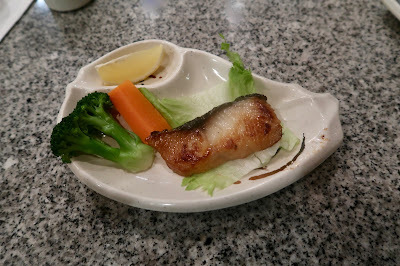 The BBQ Black Cod was served as a small filet along with some of the most teeth-exercising vegetables out there. There was some sweetness and some smokiness, but the cod could have been juicier. 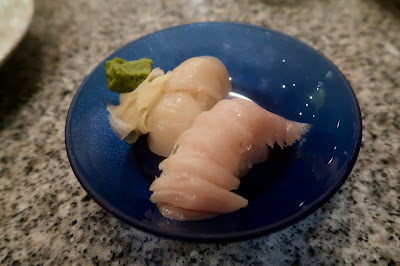 The hotate (scallop) was sweet and soft as expected, while the toro was fresh with a nice, melty texture. 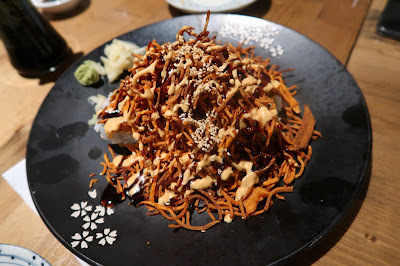 While the neta (the seafood on top) was above average, the sushi rice was mediocre as it was too tightly packed. 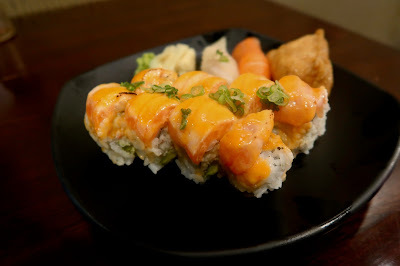 The Mango Tuna Roll came with fresh mango and some not-so-fresh tuna. The tuna was slightly fishy, and it was not very soft either. 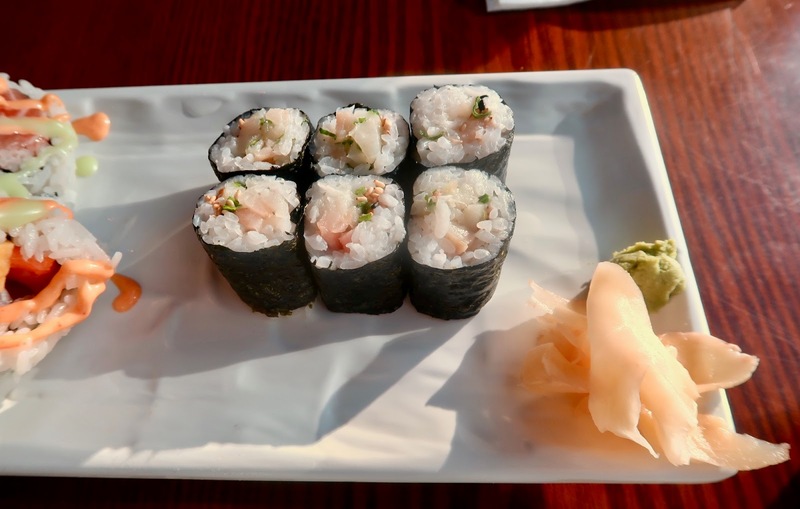 The roll was quite small, and at $8.50, it was very pricey for what it was.